Are you looking to organize your kids’ toys and supplies while also creating a great learning space? If your answer is YES, then the Step2 2-in-1 Toy Box and Art Lid is the perfect product for you! As a parent of 2 young boys, I am always looking for products that can serve more than one purpose. I am also ALWAYS looking for products that will enhance my child’s development in some way. The 2-in-1 Toy Box and Art Lid easily met both of these requirements. The 2-in-1 Toy Box and Art Lid exceeded all of my expectations. I knew it was going to be amazing, as all Step2 products are, but I had no idea how PERFECT it would be once it was set up and in-use. I have been wanting to set up a learning center for my boys and this was the perfect addition. Once the baskets are placed on the toy box shelf, there is still room for more supplies which is great! I let my kids get involved by deciding what they wanted to put in their baskets. This only added to their excitement of playing with their new Step2 2-in-1 Toy Box and Art Lid. The toy box storage department was wide and deep but still small enough for little bodies to have easy access to their toys and supplies. In keeping with the art/learning center theme, we filled our toy box with puzzles, games and arts and crafts supplies such as coloring books (large and small), paper and stickers. It held all of these products easily! 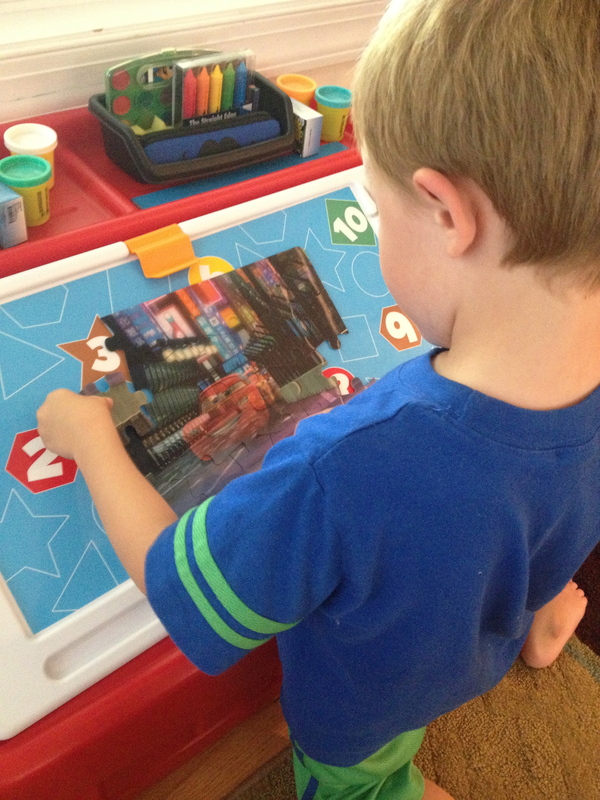 What I love the most about the Step2 2-in-1 Toy Box and Art Lid is its versatility! The art lid can serve so many purposes. The art clip allows children to keep their paper in place while creating works of art. It also allows them to display their work once it is completed. The small lip at the bottom of the lid allows it to hold books and puzzles as well. The Step2 2-in-1 Toy Box and Art Lid is not only great to store puzzles, it’s also perfect for putting puzzles together! I also LOVE that the lid can be removed and used as a floor and/or lap desk! It can be placed on the playroom, bedroom or living room floor with ease for those who like to lay down when working. The art lid also conveniently fits on a child’s lap when they are sitting on their bed or couch. Little kids often have a hard time sitting still or staying in one place. The mobility of the art lid allows kids to take their projects into any room of the house. It also allows kids to complete their work in a way that is most comfortable for them which will optimize performance! 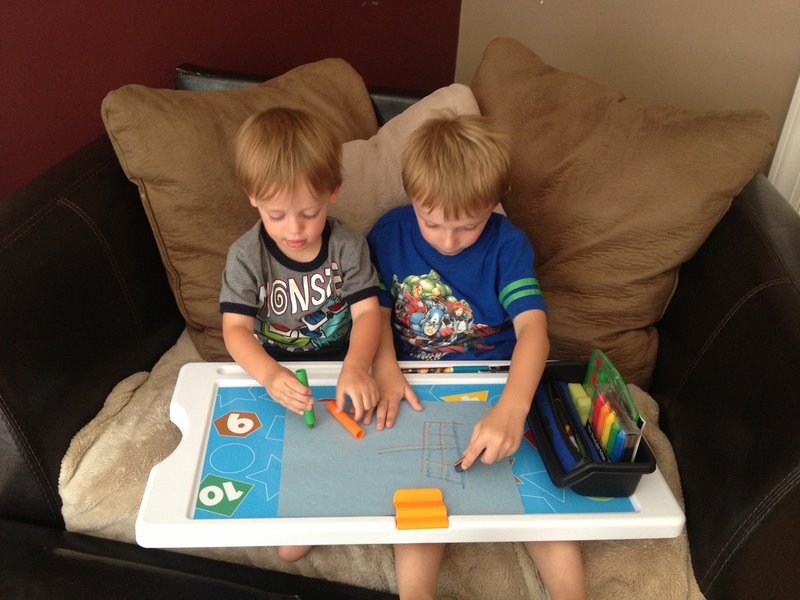 The Art Lid is perfect for coloring and drawing while sitting on the couch too! What else did I love about the Step2 2-in-1 Toy Box and Art Lid? Like all Step2 products, the 2-in-1 Toy Box and Art Lid is durable and well-made. This is so important when working with little kids. The art lid is sturdy making it great for transporting art projects, puzzles and books. The baskets are also sturdy making them easily transportable as well. The Toy Box and Art Lid are bright and colorful. We received the red toy box, but it also comes in pink, tan and blue (coming soon). I love the red toy box because it goes perfectly in our playroom, and it also matches my son’s room design. I also like all the shapes, colors and numbers on the lid which make it perfect for children working on those basic academic skills! 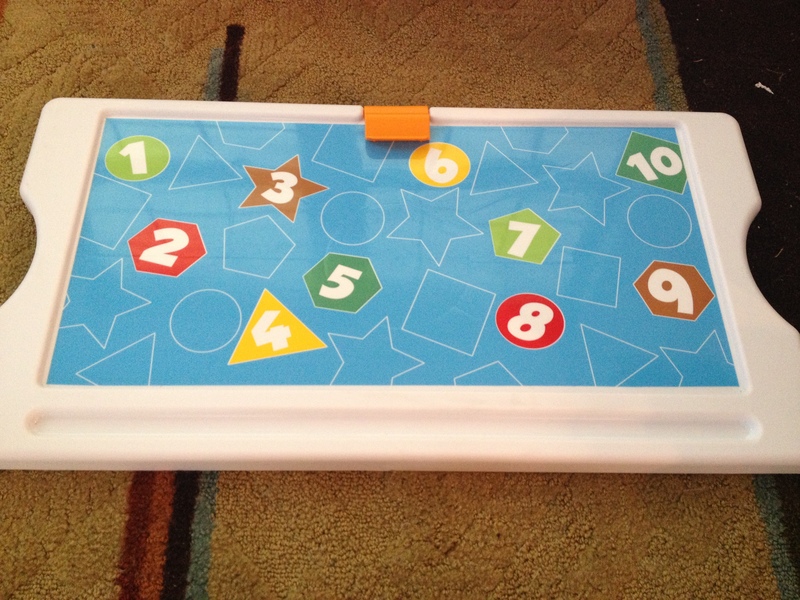 While using the toy box and/or art lid, you can ask your kids to label the colors, shapes and numbers. You can also ask them to count all the shapes as well as identify how many of each shape there are on the lid. This is a great academic activity to do with your kids, and they won’t even realize they are learning! The colors, numbers, and shapes on the Art Lid make it a perfect learning tool for kids! Now that you know how amazing the Step2 2-in-1 Toy Box and Art Lid is, I am sure you are going to purchase it right away! It is perfect for getting kids ready to go back to school and creating a learning/art center in your house. It also makes a wonderful birthday or holiday gift! The Step2 2-in-1 Toy Box and Art Lid can be purchased at the affordable price of only $59.99. Please go to the Step2 website to order it today! That’s really cute I love that it can be used in so many ways! Thank you Julia! We love using it!